﻿ Real Madrid's last stage of the season: The "James effect"
07.04.2015 » Real Madrid's last stage of the season: The "James effect"
We're entering the decisive stages of the season and Carlo Ancelotti is certainly happy to see several of his key players returning to the team. The last one making his comeback from injury has been James Rodríguez, who immediately helped Madrid crushing Granada this last weekend. Real Madrid romped to a 9-1 victory over a hapless Granada side over the weekend, Cristiano Ronaldo netted five goals and everyone rejoiced. 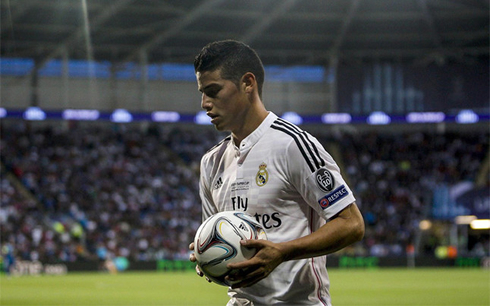 But fans at the Bernabéu were happy about something else — the return of James Rodriguez to the starting lineup. The Colombian midfielder added a much needed spark to the Madrid attack and his close relationship on the pitch with Cristiano Ronaldo was on display for all to see as the pair linked up well all match long. Since James' injuries, Madrid's form has been spotty at best. Since he went down on February 4th against Sevilla, Real Madrid have lost four of their last nine games. Of course James' injury also coincided with some bad form from the Merengues and some tougher matches, but the point still stands: Real Madrid sorely missed James Rodriguez. The star of the 2014 FIFA World Cup is going to be an important cog in the Real Madrid team, as they move forward towards the most important stage of the season. James provides something to the Madrid attack that was sorely lacking in past month and a half. Firstly and unlike Isco, who for all is brilliance still struggles to make the final pass, James Rodriguez is decisive in the final third. 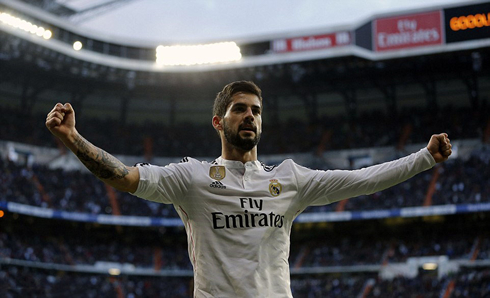 Now, Isco has been one of the standout performers this season. His dribbling and his newfound desire to help out on defense has made him a favorite of Carlo Ancelotti. But in the final third Isco can often fall flat. It's not due to any lack of skill either, which Isco has in abundance, it's his indecision and hesitancy that often lets him down. Real Madrid's highly vaunted BBC has come under heavy criticism in recent times, after some rather forgettable performances up top. The reason is directly tied to the lack of service. When Cristiano Ronaldo, Karim Benzema and Gareth Bale are forced to create on their own, they struggle to find space. With James Rodríguez and of course Luka Modric back, we will definitely see more inventiveness from Madrid's attack. But where does this leave Isco? Well, we won't find out for a few days. Gareth Bale is likely to be left out of tomorrow's game against Rayo Vallecano, after picking up a knock in training. We'll likely see the return of the 4-4-2 which served Real Madrid so well against Liverpool and Barcelona earlier in the season. Cristiano Ronaldo next game will be in La Liga against Rayo Vallecano, on the 8th of April of 2015. You can watch Juventus live stream, Rayo Vallecano vs Real Madrid, Barcelona vs Almeria, Blackburn Rovers vs Liverpool, Napoli vs Lazio, and Bayer Leverkusen vs Bayern Munich, all matches provided from our streams live section.